At sunrise, on October 7th 2014, I noticed a small green light blinking on the ocean just south of our house, flashing on and off at regular intervals. Well, that needs to be investigated. 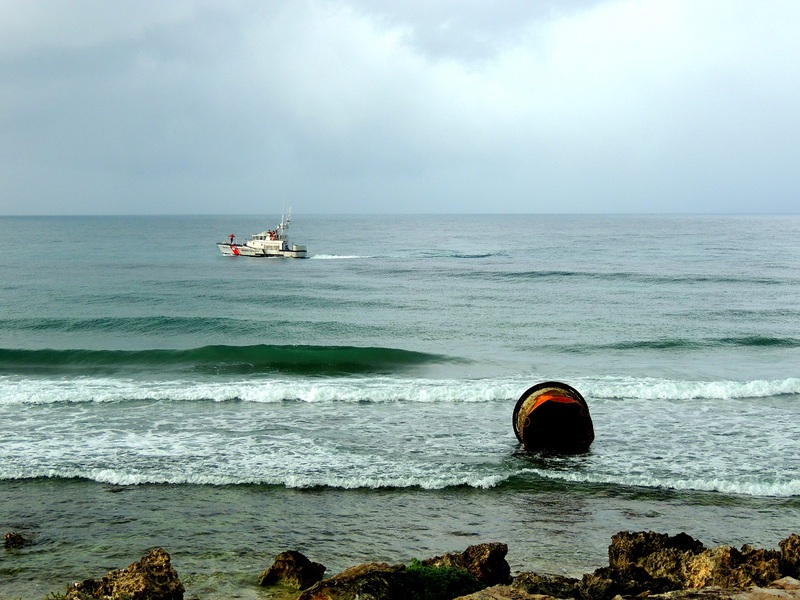 My camera has a decent lens so I zoomed in for a better look; it was a huge marker buoy drifting free, and bobbing its way north towards our beach. 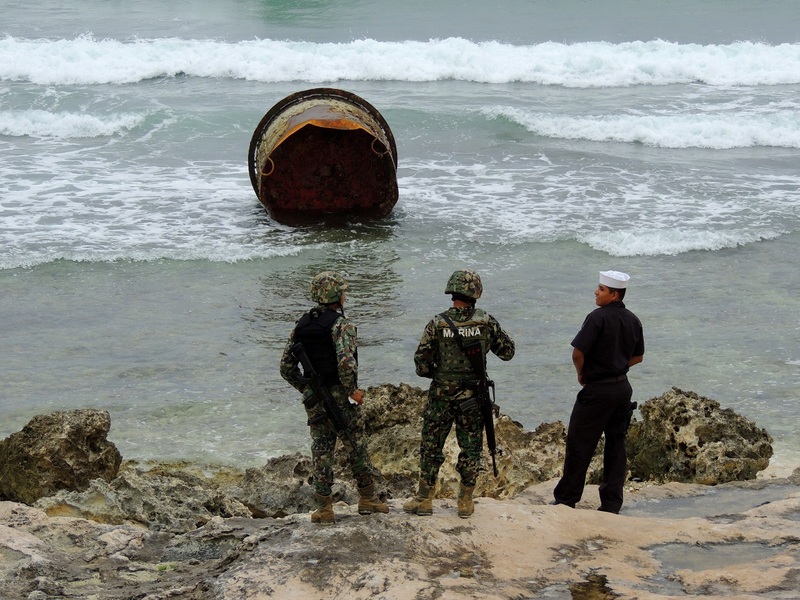 A group of marinas (sailors) arrived, a non-commissioned officer and his crew, to check out the buoy. The weather turned foul so we invited the guys to take shelter on our patio, offering them coffee and snacks while they waited for a decision from higher-up. The navy bosses were in communication with the harbour master and two employees arrived mid-afternoon to check the situation. One lucky guy was designated to retrieve the valuable GPS beacon. The ocean is very warm in October, but dressed in protective gear it was a bit of a struggle for him to wade into the thigh deep water and remove the heavy beacon, still transmitting its location at 21 14.5 N and 86 44.1 W.
It is good thing the beacon was removed, or we could have had ships trying to take a position reading off of our house. We envisioned an unscheduled cruise ship visit, similar to the Costa Concordia that ran aground in Italy in 2012. By noon we were serving ham or chicken sandwiches to the on-shore crew complete with a choice of coffee or pop and chocolate chip cookies for dessert. It was a pretty good gig, hanging out with us while the jejes decide what to do with the marker buoy. Around three in the afternoon the officer in charge flashed us a big friendly smile and said that the weather had become too rough and the cutter was not going to be able to pull the marker buoy back out to sea. Yep, four years ago last week, and we still have a huge piece of rusting scrap iron rolling around in our neighbourhood. 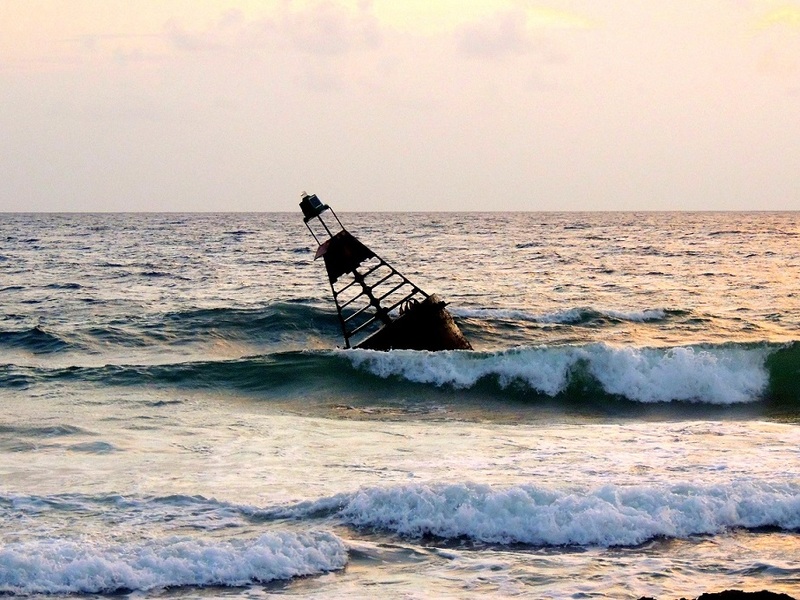 Back in 2014, I started taking annual photos of the life and times of the navigational buoy. For the first few weeks the air stank of rotting sea creatures, until our neighbours helpfully hired a young friend to scrape the dying barnacles and mussels from the exposed bottom. So how big is this thing? It has a six foot diameter, and without wading into the water with a tape measure to get the exact measurements, we think it is about fifteen to eighteen feet tall. It’s big and it’s heavy. 2016 October, pointed straight at our casa. We had considered decorating it up for various holiday celebrations: Halloween, Christmas, Valentine’s Day and Independence Day. We have had friends offer to paint it with cool designs. One graffiti ‘artist’ did add his tag, but thankfully the weather removed the mess within a few weeks. No one was allowed to remove, or move it, or even consider cutting it up. It is federal property, but the feds don’t want it, the navy doesn’t want it and the harbour master doesn’t want it. 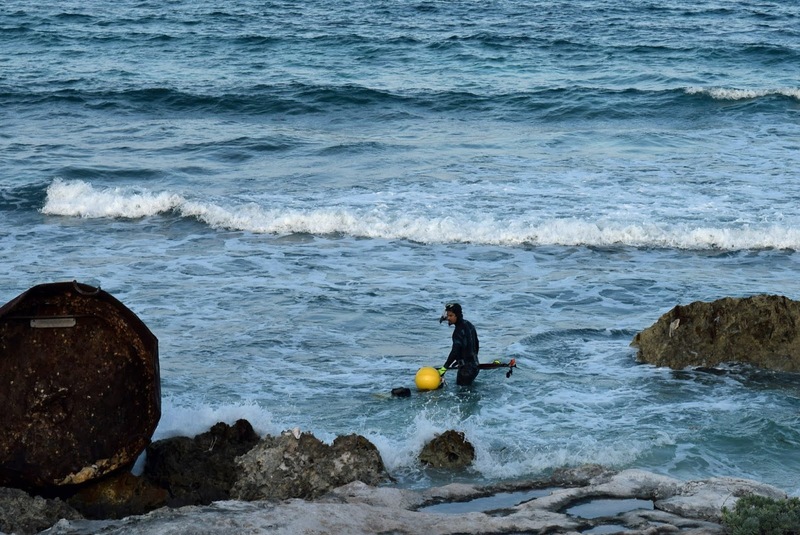 The first week or two that the buoy was here it moved around a bit, a little to the north, a little to the south, ever closer to shore until it is now half out of the water and stuck between two rocky outcroppings. Our biggest concern is not esthetics, but of safety. A big storm could turn this thing into a missile and shoot it straight at our house, knocking out walls and ripping down support columns. Or, conversely it could be swept out to sea during a hurricane becoming a dangerous navigational hazard, unlit, unmarked, and big enough to punch a hole in a large ship. We know it is not the fault of the folks that work for the navy or the harbour master. We have the greatest respect for them. They are willing, and helpful. The decision came from higher up the pay-scale ladder.It was just not in the budget. In September 2017, when Hurricane Irma turned away from us, towards Florida, we had several days of big waves. 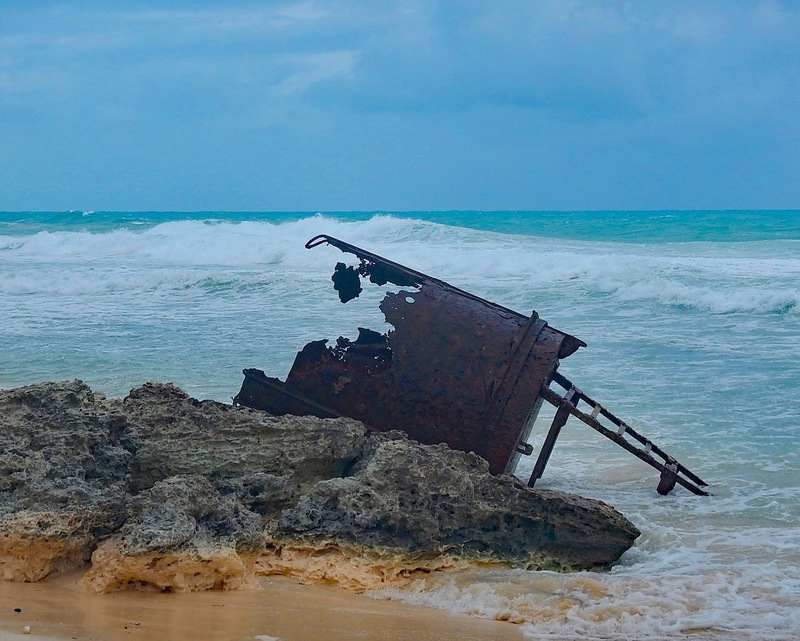 We watched with trepidation as the buoy pounded against the three-foot high ridge of coral and sand protecting our house from the floating hunk of metal. At sundown it was pointed like a missile right at our casa. 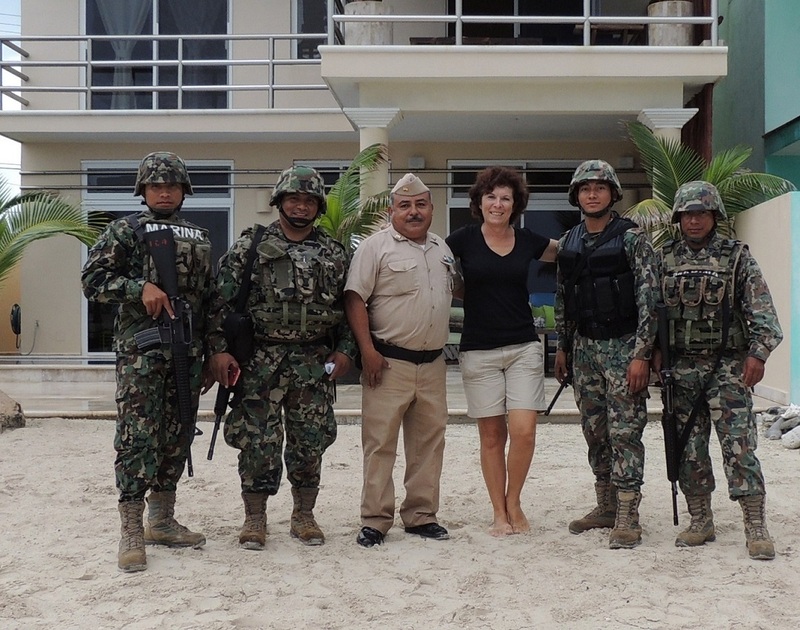 When we checked again at sunrise, it had bounced over the rocks moving north and stopping on the beach in front of Maravilla Caribe. 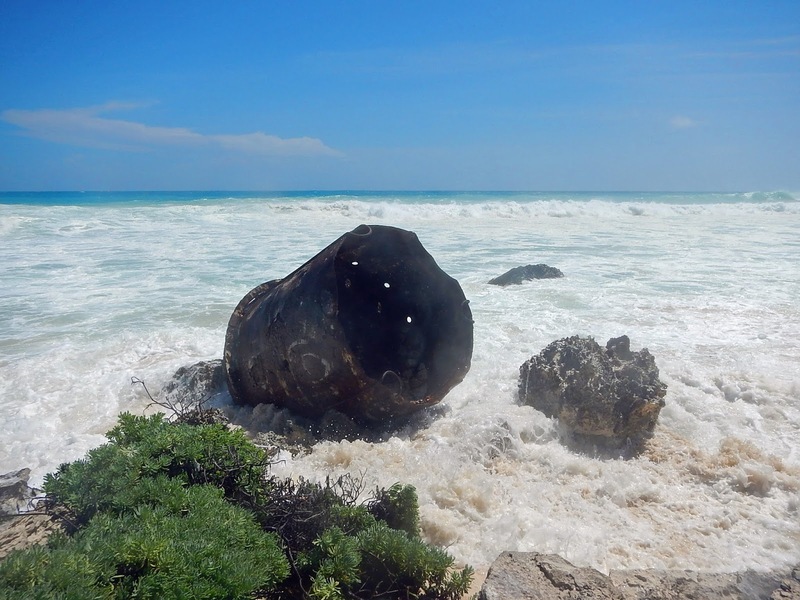 A short time later Tropical Storm Nate moved the buoy a little further north to Punta Piedra’s beach. Amy Canto decided to have fun with it, instead of obsessing over the unsightly hunk of metal. 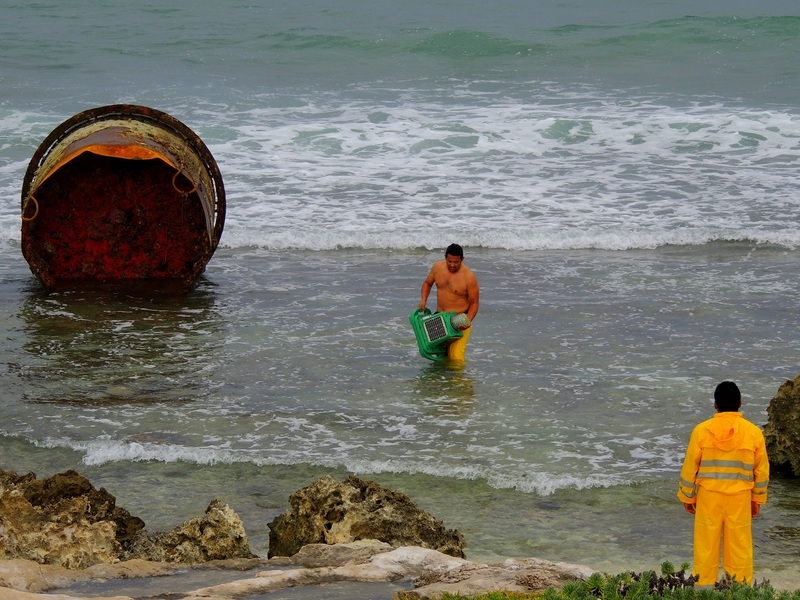 She made a ‘man’ by stuffing a pair of pants and a shirt with sargassum seaweed. His head was a round white fishing float, with a sombrero plopped on top. 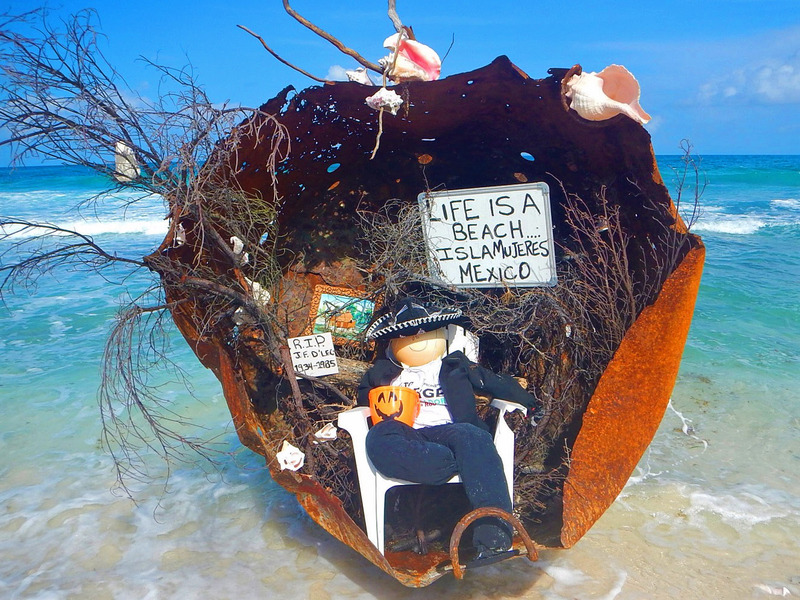 Juan sat in an old beach chair inside the buoy with his bottle of tequila and a plastic Halloween pumpkin. He provided lots of chuckles for her guests, until another storm washed him away. I found pieces of Juan all along the beach, pants, hat, and head. Amy reassembled him, but the winter storms just wouldn’t leave the poor guy alone. Eventually he disappeared. Then on October 7th 2018 the weather forecast predicted that Michael, a Category 1 Hurricane, would pass between Isla and Cuba. The worrying and wondering started again. Where would the damn buoy land this time? 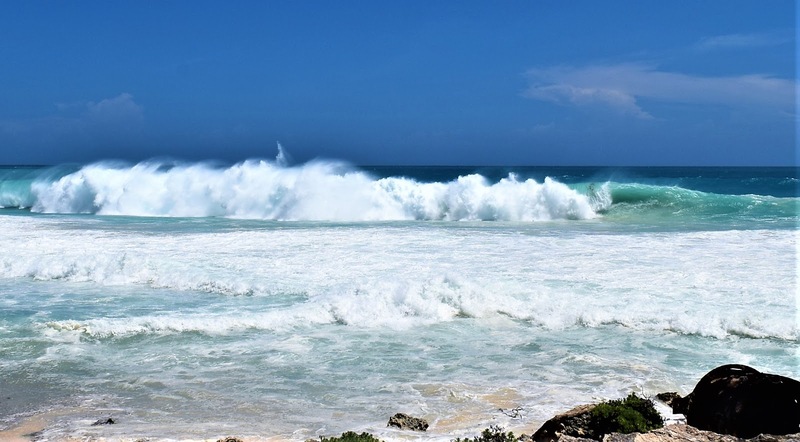 Fortunately for us, Hurricane Michael skidded past Isla Mujeres doing very little damage, but it was a category 5 by the time it battered the Florida panhandle. All we can do is hope everyone is safe, healthy, and only a little wet. 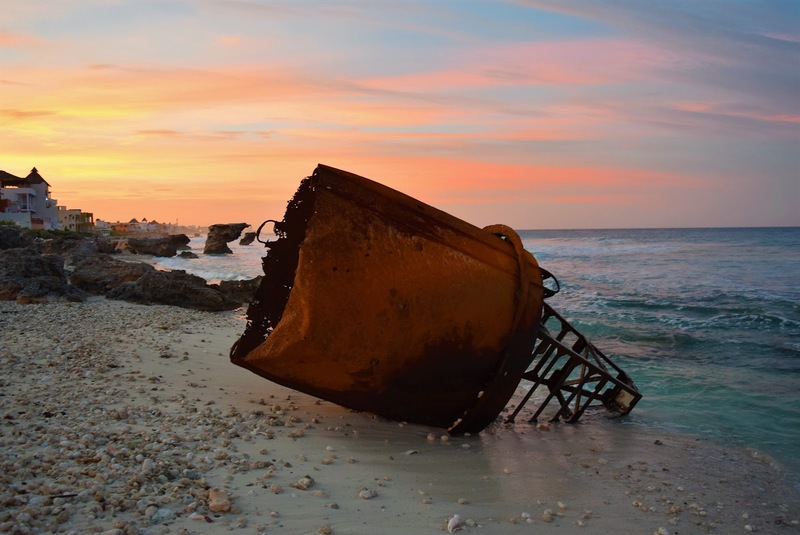 The remnants of the navigational buoy are a tattered shell of the heavy structure that arrived four years ago, but it is still capable of floating. We currently have a disturbance forming just south of Mexico, and Tropical Storm Nadine in mid-Atlantic. Hurricane season doesn’t end until November 1st, and then we can breath a sigh of relief. In the meantime, Mañana, doesn’t mean tomorrow, it just means not today. 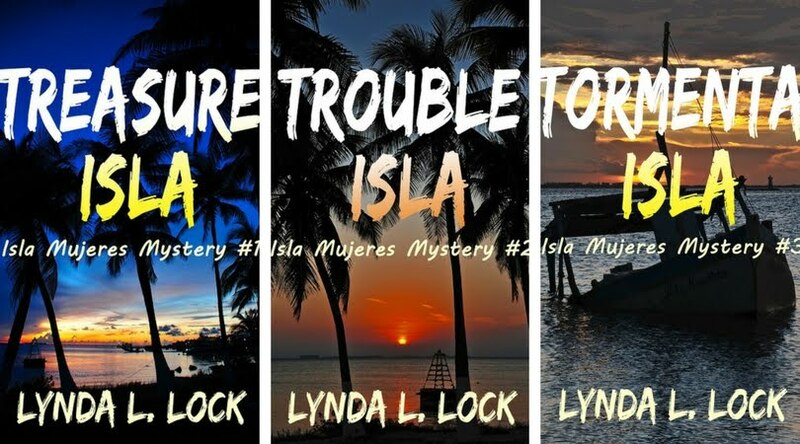 A mysterious disappearance of a local man and the looming threat of hurricanes headed towards the peaceful Caribbean island of Isla Mujeres create havoc in the lives of Jessica and her rescue mutt, Sparky. 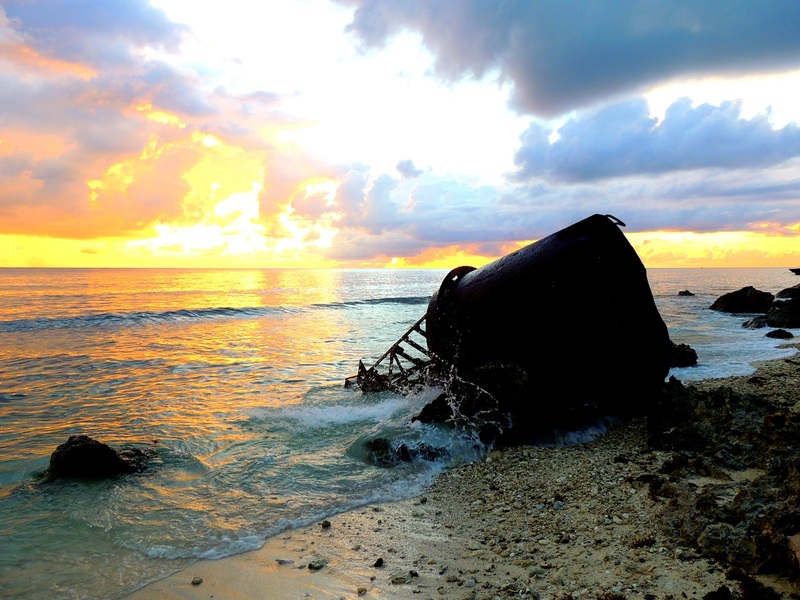 Previous PostPrevious It’s a sweet, sweet life living by the salty sea – unless it’s metal! !